GENEROUS WEEKEND ON SETIK.BIZ: A NETWORK CAMERA FOR FREE JUST FOR YOU! here we are with our weekly date with the great promotions by Setik! On our e-commerce you can find the best CCTV products from the most famous brands, such as Dahua, Bentel Security, Hyundai, Tiandy. This weekend, we would like to celebrate the last one: Tiandy. Tiandy is one of the biggest Chinese CCTV manufacturer, specialized in IP Network products with Video Analysis functions. To celebrate its reliability and success, this week we would like to give you the chance to try it FOR FREE! 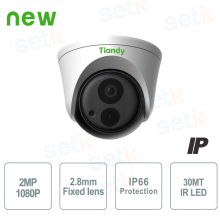 From Fridat 18th January at 6PM, by reaching an order minimum amount of 200€ (VAT included), you may choose between a free Bullet camera or a free Dome camera by Tiandy! How to enjoy this unmissable promo? The Tiandy camera will be automatically added inside your cart after clickinh og the relevant discount code. Hurry up: the promotion will be effective until Monday 21st January at 10AM! Get ready, a new prestigious brand in the Security field will soon be available on our e-commerce: welcome to Ajax Systems! Why choosing Ajax products for your safety? Let's keep in touch, we will show you the first available products in a few days!